Become part of an online fighting force. If you're ready for the challenge of true team-based online action, you'll find it in Team Fortress 2: Brotherhood of Arms. 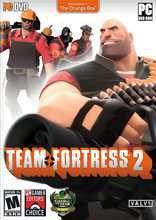 With TF 2, you'll go into battle as part of a cohesive squad of fellow warriors all bent on the same goal - whether it's storming a beach, demolishing a bridge or escorting a VIP to safety. And you'll do it knowing your teammates are watching your back as carefully as you're watching theirs. Begin by assuming one of twelve roles, each with unique strengths and weaknesses. If you're looking for a straight-up fight, you'll choose Marine or Commando. Prefer the shadows? You'll make a cunning Spy or Sniper. Medics and Engineers support their teammates through bravery and ingenuity. Focus the raw force of your team's talents through communication and strategizing. Whether you're extracting hostages or defending an installation, you'll know the thrill of being part of the Brotherhood of Arms.